Sure, it’s cheap, and it’s cheesy, but this film’s just chock-full of pirate-y goodness, and pirate-movie fans owe it to themselves to dig up a copy. How did this thing even happen? Well, back in 1950, Disney made a new version of Treasure Island, which Walt thought was pretty clever because it was a beloved property that was in the public domain, so he didn’t have to pay for it. Jump forward three years and Byron Haskin, who’d directed Island for Disney, realizes that because the source was public domain, Disney can’t stop him from shooting a sequel. (This is a lesson Disney never forgot.) 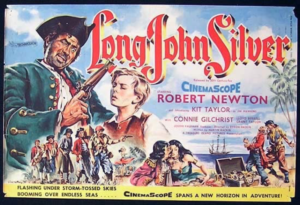 Haskin contacts Robert Newton, who’d made such an impression as Silver in the Disney Version; Newton, who hadn’t handled Hollywood success very well, had fled back to England to escape his debts, so he’s happy to do it. Haskin proposes shooting in inexpensive Australia, where he’d made His Majesty O’Keefe the year before, Newton agrees, and Bob’s-your-uncle. Silver knows Mendoza, and persuades the Governor to let him handle the ransom transfer. He then performs a double double-cross, retrieving both daughter and ransom money, meanwhile pillaging the Governor’s warehouse and blaming it on Mendoza. Not-so-incidentally, he also liberates young Jim Hawkins (Treasure Island’s protagonist, played adequately by Kit Taylor), who should have been enjoying his newfound wealth back in England, but for some unexplained reason was serving as Mendoza’s enslaved cabin boy. McGuffin time! Jim, who’s still “smart as paint” (requotes from Island are common), has a medallion that holds the key to the location of a second hoard hidden on Treasure Island. The movie veers briefly into farce as Silver tries to trick Jim into giving him the medallion, while avoiding being maneuvered into wedlock by the proprietess of the low dive, but soon Jim, Silver, Mendoza, and two scurvy pirate crews are off across the Caribbean to plunder Cap’n Flint’s second treasure. The last half of the film shamelessly pillages and recombines elements of Treasure Island, unburdened by any tiresome good guys this time except for Jim. It’s a real scoundrel-fest, sudden reversals are the order of the day, and “those who died are the lucky ones.” I won’t reveal how it ends except to say the finale hinges on two words: doubloon grenades! One caveat: it seems there’s no good restored version of this film available digitally: all the prints floating around are pan-and-scan, and most of them are in terrible shape. Ye be warned!